In a spot of kismet many years ago, two men got together and spun a collaboration the likes of which would forever change the face of modern design. 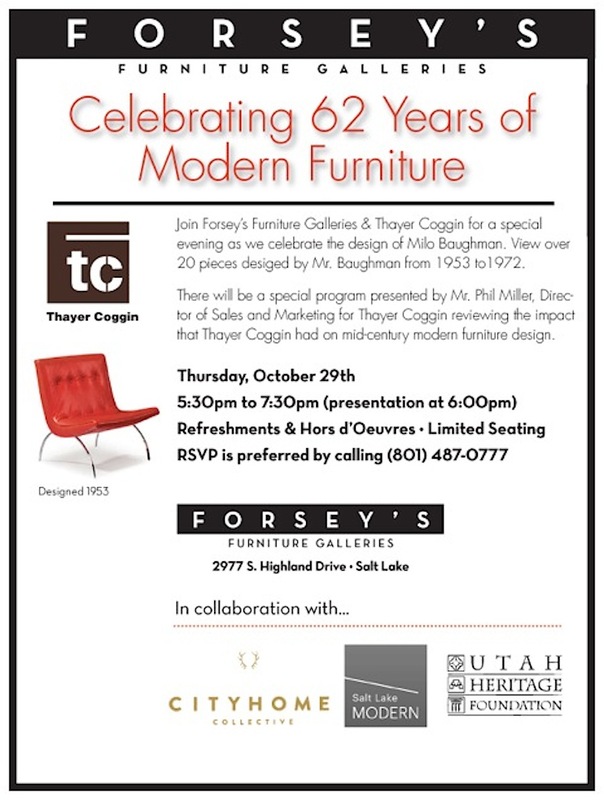 Thayer Coggin and Milo Baughman, furniture maker and designer, respectively, have undeniably shaped the mid-century modern era of furniture. Their designs (think: Draper Chair, Viceroy Recliner, Scoop Chair, Darren Sofa, and many exceptional others) are stunning to say the least, and it's no question as to why they've remained relevant so many years after their inception. Still an inspiration to many in the design community today, their furniture's legacy is a lasting one to say the least, so suffice it to say we're obviously more than a little thrilled about an upcoming event at Forsey's Furniture Gallery. Thursday, October 29th, Forsey's will be showcasing some 20-30 o-ri-gin-al Milo Baughman pieces in their showroom, and we're beside ourselves at the thought of being so close to such inspirational pieces. (The last time these sensational designs were in such close proximity to our hungry eyes was two years ago, when Forsey's hosted a similar event in their space.) Should the feast of the eyes not suffice, food, drink, and tunes should all prove ample incentive to turn up. Seating for this uncommon occasion is limited, so wise readers will hop to it and RSVP to save a space. We can't guarantee that these phenomenal furnishings will be within arms' reach again.